Wolf 498 (Gliese 526, Lalande 25372) - Singular red dwarf (M1.5V) in BoÃ¶tes, 17.7 light-years from Earth. It has a mass of .44 Solar and is a UV Ceti flare star. The system is administered by the United Nations Space Agency and is a transit star between Sol and the International Ring. Commercial interests have pressed the U.N. to move the wormholes to orbits closer to the sun to reduce the two-week-plus transit time through the system, but authorities have balked at the move, saying the risk from flare damage to ships would increase to dangerous levels. 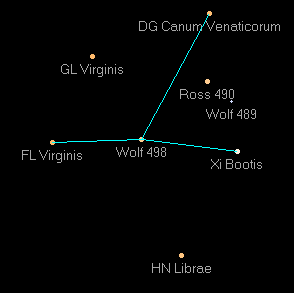 Wolf 498 was also a launching point for the exploration of the Xi BoÃ¶tis A, a nearby G8V star that, despite positive long-range surveys, did not contain a planet suitable for human life.